Ranunculus are a very sweet way to add interest to your wedding flowers. They are not as commonly used as roses, but they give a similar look and come in just about as many colors. Ranunculus are available mostly in the spring-time. Although they are out of season in the summer months, they do reappear in mid-fall through winter. Ranunculus are similar in price to roses, but are slightly smaller in size. Here is a shot of a bridal bouquet that we did for a bride of ours just this past weekend. This very feminine bouquet was all ranunculus (about 36 stems). Ranunculus are a great flower for mixed bouquets as well. 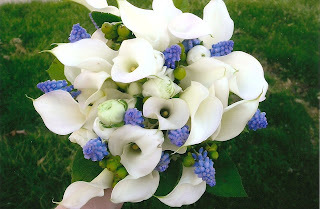 They are featured here as a nice round alternate shape to mini callas and blue muscari. Ranunculus are a great “inspiration” flower to use in your wedding or event! !